If you own or operate a commercial kitchen, you have an obligation to maintain safe working conditions for your employees in compliance with OSHA standards. 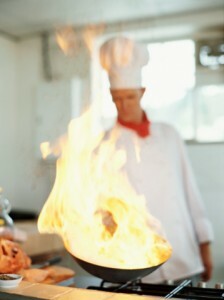 Fire is a serious risk in any commercial kitchen setting, and you need to be sure that you are doing everything possible to protect your employees and your property from the potentially devastating effects of a kitchen grease fire. Here are the main points to cover in your kitchen fire prevention plan. Because grease traps and filters can become reservoirs of fuel for potential fires, naturally it is very important to clean or change them out regularly. Flue Steam offers a convenient grease filter exchange service to help commercial kitchen owners ensure that they always have clean filters installed in their system. In the course of normal kitchen operations, vaporized grease is going to build up on the inside of kitchen exhaust hoods and ductwork. This accumulated grease must be removed regularly to ensure it does not build up to dangerous levels. Exhaust hoods will need to be cleaned more frequently, but this can be done with relatively inexpensive hand scraping. The insides of the ductwork will only need cleaning a few times per year. This can be accomplished using steam cleaning techniques that reach to every corner and crevice of the system. Exits must be clearly signed, and exit routes should be kept clear of obstacles and adequately lit to ensure that employees and customers can quickly and easily find their way out of the building in the event of a fire. Employee training is also vital, because without proper training employees will not know how to utilize the fire safety equipment and other protections provided for them. Make sure that employees know how to operate hand-held fire extinguishers as well as the automatic fire suppression system, but also communicate to them that fighting major fires should be left to the fire department. All they have to do in the event of a serious fire is sound the alarm, activate the automatic fire suppression system, and exit the building.